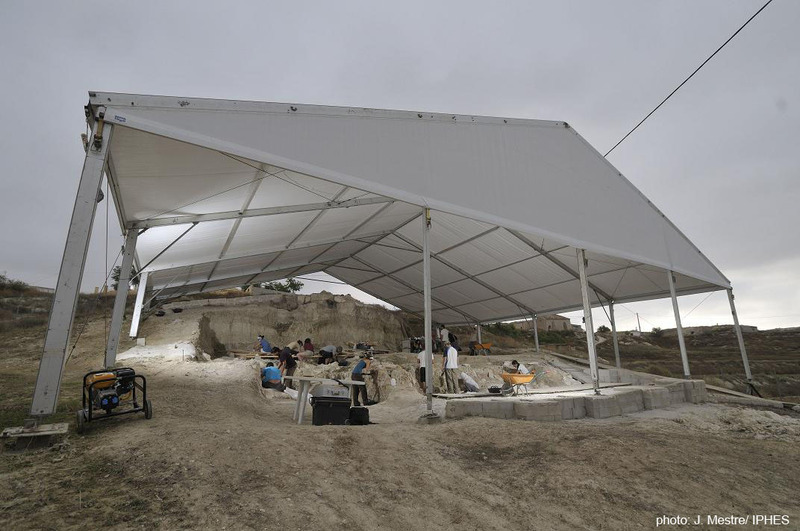 The Guadix – Baza project is devoted to the archaeology of the first human settlement in Western Europe, the palaeontology and the palaeoecology of that region since the Late Pliocene. Although its objective and aim is to comprise the whole basin and the totality of human occupation located there, and this is the reason because we undertook survey in some sites such as Solana del Zamborino, Huéscar 1 and Cúllar, the project is specially focused on the Orce sites: Venta Micena, Barranco León and Fuente Nueva 3. All are located in the eastern shore of the former Baza saline lake, placed in the eastern half of the Guadix – Baza basin. The time span of these sites ranges since the Venta Micena chronology, 1.5-1.6 million years ago, a site where until now no human record has been detected. The second phase corresponds to that of Barranco León, around 1.4 million years ago, recording the oldest human settlement in western Europe, where a human tooth was recently published, followed by that of Fuente Nueva 3, dated 1,3 million years old. Those chronologies have been obtained by the combination of biostratigraphic methods, namely on micromammals, paleomagnetism and radiometric dating techniques, mainly through ESR. Concerning the palaeoecology, the three sites correspond to lake-margin position. Nevertheless we can distinguish them by the bigger or lesser amount of water present in each place, as it is indicated by micromammals. Venta Micena corresponds a marsh area inside an open savannah environment dominated by the presence of abundant ungulates and large carnivores, such as the short faced giant hyena and sabre-tooth tigers. The mammal community is indicating a mixture of a basically Eurasian fauna with few species of African origin, a combination that is present in all the three sites, even the precise ecological position is different for each one, since Barranco León corresponds to an ancient channel margin and Fuente Nueva 3 is related to a former spring. Barranco León and Fuente Nueva 3 are bearing a very rich archaeological record composed by the remains of the anthropic access to the carcasses of large mammals and by a huge collection of lithic tools, actually the richest in Western Europe for the oldest human dispersal in the region. The debitage techniques recorded in the Orce sites are dominated by the bipolar-on-anvil percussion and the free-hand orthogonal debitage, by a wide presence of very large tools probably related to percussive actions, and by the absence of small shaped tools. The widely recorded orthogonal and polyhedric cores are finally showing a primitive Mode 1 technology with important African roots in Western Europe. The research team is leaded by Robert Sala and Bienvenido Martínez-Navarro, with the collaboration for Paleontology of Jordi Agustí and Paul Palmqvist (Universidad de Málaga), while in the archaeological direction is shared with Isidro Toro (Museo Arqueológico de Granada), Leticia Menéndez and Juan Manuel Jiménez-Arenas (Universidad de Granada).